The German conquest and occupation of Belgium during World War II is a dark chapter in the history of the nation. On May 9, 1940, a black Mercedes automobile drove inconspicuously away from the Reich Chancellery in Berlin and merged with the weekend traffic. The car appeared to be an ordinary vehicle transporting a high-ranking Nazi official. In the suburb of Berlin-Finkenkrug, the automobile entered an abandoned railway station protected by the SD (German Security Service). The occupant, Adolf Hitler, exited the Mercedes and went aboard his special armored train, ironically named Amerika. Hitler’s secretaries thought they were headed for Denmark and Norway to visit the troops. After dark the train turned west, reaching Hanover by midnight, where it switched tracks. After traveling all night, the train arrived in the village of Euskirchen near the Belgian and Luxembourg border. It was there that Hitler and the other occupants exited the train and entered three specially constructed Mercedes limousines. After a short ride, the vehicles stopped near several old antiaircraft gun emplacements that had been converted to bunkers. Hitler had come to see firsthand the beginning of Case Yellow, the Nazi invasion of France and the Low Countries. The serenity of the scene would soon end with the sound of artillery fire from the west. Hitler stated, “Gentlemen, the offensive against the Western powers has just started.” The attack was a new form of warfare, Blitzkrieg or Lightning War, which was first used in Poland the previous September. Blitzkrieg was a term coined by Western news reporters to describe the speed and destructiveness of the German attack on Poland. One of Hitler’s adjutants silently made note of the date and time, 5:35 am, May 10, 1940. Prior to execution, the planning for Case Yellow had undergone a number of changes. One of the major reasons for changing the original plan occurred on January 10, 1940, when a German courier aircraft flying to Cologne got lost in fog and crashed in Belgium. The courier on board, Major Helmuth Reubriger, a staff officer of the German 7th Airborne Division, was carrying detailed plans for the Western offensive. As Reubriger ran for some nearby bushes, he set fire to the contents of the briefcase. Belgian soldiers spotted the fire, stamped it out, and retrieved what was left. The Belgians did not pass along a complete set of the plans to the British and French, only a two-page synopsis, and refused to say where they had obtained them. The plans were so detailed and their capture so fortuitous that the Allies, especially the French, were suspicious that the whole event may have been a hoax. General Maurice Gamelin, the commander in chief of Allied forces in France, was satisfied with only issuing a general alert. Gamelin felt that even if the captured plans were true there was not much he could do about it. On January 17, Belgian Foreign Minister Paul-Henri Spaak sent for the German ambassador and told him flatly, as the latter reported to Berlin, “The plane which made an emergency landing on January 10 had put into Belgian hands a document of the most extraordinary and serious nature, which contained clear proof of an intention to attack. It was not just an operations plan, but an attack order worked out in every detail, in which only the time remained to be added.” One thing is certain as a result of this incident. The day after Hitler was informed he postponed the attack. By the time the plan reemerged in the spring it had completely changed. The swift German offensive codenamed Case Yellow drew French and British armies into Belgium with a feint as the main German thrust knifed through the rugged Ardennes Forest and threatened to cut off hundreds of thousands of soldiers. The Nazi dash to the English Channel capped a spectacularly executed movement. The new plan for invasion was the brainchild of General Erich von Mainstein, chief of staff to Field Marshal Gerd von Rundstedt, commander of Army Group A in the upcoming operation. The plan was based on the German belief that the French and British would advance into Belgium. Code-named Sichelschnitt (Sickle Stroke), it was to be carried out by three army groups. Army Group B, the northernmost commanded by General Fedor von Bock, was to move into Holland and northern Belgium in an attempt to draw the Franco-British armies as far east as possible. 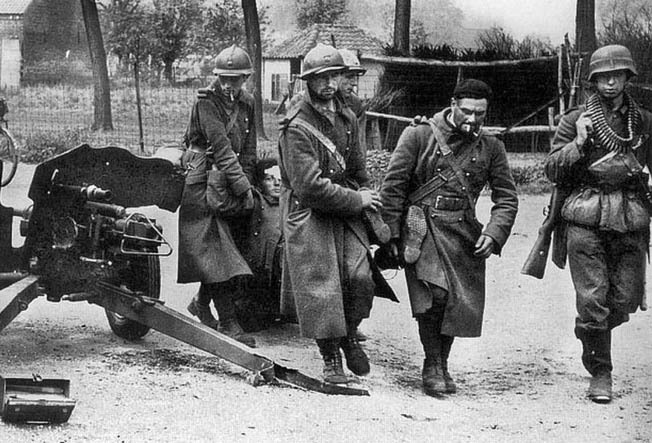 Army Group C, the southernmost under the command of General Wilhelm Ritter von Leeb, was to move against fixed fortifications of the Maginot Line on the French frontier. Rundstedt’s Army Group A, in the center, was to advance through the Ardennes Forest, drive northwest, and finally reach the English Channel coast, trapping approximately one-third of the Allied armies. On the morning of May 10, 1940, the initial attacks were by the Luftwaffe, hitting Allied airfields, railroads, and other key points in France to disrupt communications. The attacking forces were made up of 137 divisions and more than 2,000 tanks. To support the massive assault, 3,800 Luftwaffe aircraft were available. Even though the Allies knew such an attack was possible, it came as almost a complete surprise. It was not long before German divisions were racing across Belgium and Holland, encountering generally weak resistance. The Luftwaffe provided close air support for advancing German armored and infantry columns and struck fear into the civilian populations of many Belgian towns. The BEF moved to positions along the Dyle River without being hindered by the Luftwaffe, which was in the process of destroying the Belgian Air Force, for the most part caught on the ground. There was another reason why the Luftwaffe did not hinder the Allied movement into Belgium. It suited the German plan perfectly. The confusing command structure between the BEF, the French, and the Belgians did nothing to help the Allied situation. After several days of fighting, the Germans had not succeeded in penetrating any of the positions held by the BEF. However, a 5,000-yard sector of the line held by the French had been breached, causing the British to reconfigure part of their line. As for the Belgians, they had fought well along their frontier but were not able to hold out as long as they had expected. They, as well as the Dutch, could not cope with the tactics of the Wehrmacht. The Germans were seizing vital bridges using small groups of specially trained troops who would come in silently at dawn on gliders and capture the bridges before they could be blown up. One of the Germans’ greatest successes was at the Belgian Fort Eben Emael located at the junction of the Meuse River and Albert Canal. This modern fortress was thought to be the most impregnable structure in all of Europe, much stronger than anything the French had built along the Maginot Line or the Germans in the West Wall. Glider troops attacked Eben Emael with precision and quickly captured the fort. A Belgian mother and her children attempt to escape the war that has come to their doorstep. As the Germans advanced westward, many civilians were displaced, clogging the roads toward temporary safety and impeding the progress of Allied troops as they sought to regroup. Gamelin and his staff had no real idea how fast events were moving. French troops did go into Holland, but the Dutch Army had retreated too far to the northeast to create a common front, and the Belgian forces, including those along the Dyle, began falling back as their right flank was turned. The Wehrmacht had 29 divisions committed to seizing northern Belgium and Holland. There were 45 divisions committed to moving across central France and northwest to cut off the French and British forces in Belgium. On May 14, General Alphonse Georges, commander of the French Northeast Front, flung himself into a chair and burst into tears. “Our front has been broken at Sedan,” he announced. On May 15, the German armor began its breakout from bridgeheads across the Meuse. Holland surrendered that day after enduring the devastating bombing of Rotterdam. French Prime Minister Paul Reynaud phoned British Prime Minister Winston Churchill and told him, “We are defeated—we have lost the battle.” The Allies were now in the process of a massive withdrawal. 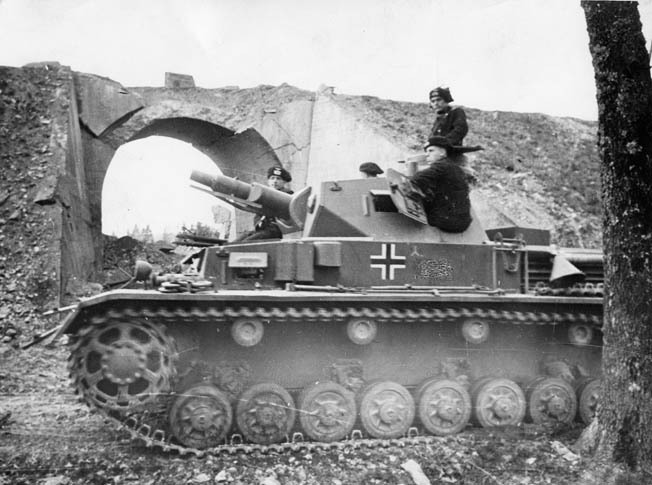 German Army Groups A and B were on the move. Although the breakthrough in Belgium was not the decisive stroke that the Germans had hoped for in the West, its success cannot be understated. It had drawn the Allies’ attention in the wrong direction, which absorbed their mobile forces in the fighting so that they could not be used on the French frontier where they would have been more useful. The effect of the German move through the Ardennes owed much to the French response, which seemed to fit perfectly into the revised German plan. Early on the morning of May 28, Belgian King Leopold III surrendered. The headstrong young ruler had previously taken his country out of its alliance with France and Britain, declaring the country neutral. He had even refused to restore the alliance at a time when he knew the Germans were preparing to invade his country. Leopold surrendered against the unanimous advice of his government, which by the constitution he was sworn to follow. Three days before his surrender, Leopold had met with three members of his cabinet, including both the prime minister and foreign minister. They urged him not to surrender and become a prisoner of the Germans. Leopold responded, “I have decided to stay. The cause of the Allies is lost.” The Belgian government’s repudiation of his decision to stay with his troops rather than join the London government in exile would lead to postwar issues over his right to the throne. Leopold was held prisoner by the Germans at his royal chateau near Brussels until 1944 and then in Austria until the end of the war. This German tank is one a relative few PzKpfw. III models that took part in the conquest of Belgium, France, the Netherlands, and Luxembourg. The PzKpfw. III mounted a short-barreled 50mm cannon, comparable to the best weapons mounted on heavy British and French tanks. Leopold’s capitulation was strongly denounced by Reynaud and Churchill. Despite the Belgian king’s behavior, his army had fought with honor and gallantry. It stood fast for a lengthy period, absorbing the unmerciful bombing of the Luftwaffe and the onslaught of German armor. This could not be said of all Allied troops fighting in the campaign. Whenever German troops occupied a country, Hitler’s financial agents would seize the gold and foreign holdings of its national bank. In addition, staggering “occupation costs” were assessed. At the postwar Nuremburg trials, it was estimated that the Germans extracted occupation costs that amounted to approximately two thirds of the national income of Belgium. The Third Reich also began to take advantage of the economies of conquered countries in less obvious ways. The exchange rate in Belgium and other occupied nations was set at a level most favorable to the German Reichsmark. Germany would import huge quantities of goods legitimately from conquered countries, in addition to simply looting them, but did not pay for them by commensurately increasing its own exports. Instead, Belgian French, and Dutch firms exporting goods to Germany were paid by their own central banks, and the amounts paid marked up as debts to the Reichsbank in Berlin. The overvalued Reichsmark also allowed German companies to gain control of rival firms in occupied countries. 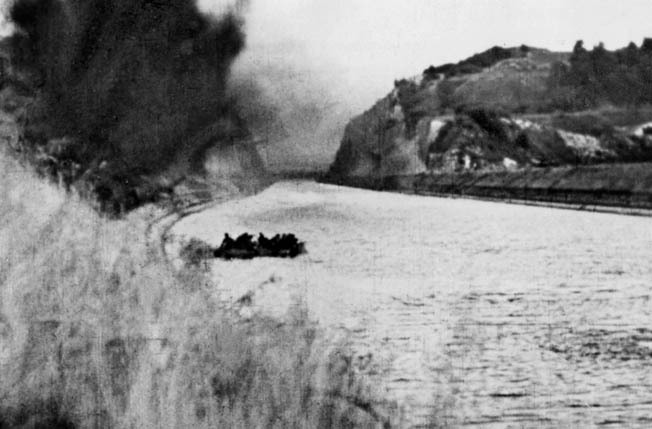 In this still photograph from the German propaganda film Sieg im Westen, or Victory in the West, Nazi soldiers cross the waters of the Albert Canal in a small boat. The action took place during the assault on Fort Eben Emael, which was thought to be virtually impregnable. The fort fell to a coordinated strike led by German glider troops. Coal, the basic fuel for generating electricity, was available in huge quantities in Western and Central Europe. However, production in occupied countries went down as workers slowed, and some even went on strike over food rationing and deteriorating conditions under the Germans. The drafting of farmworkers as forced labor in Germany had a huge effect in Belgium and other occupied countries. The German occupiers introduced food rationing, reducing the calories allotted to individual Belgians to 1,300 per day. This led to a situation where the economies of the occupied countries did far less than had been hoped to help the German war effort. A vigorous black market emerged. The quick surrender of King Leopold III, which had caused such anger in London, was seen in Belgium as a unifying act. His presence, even though it was in confinement in Brussels, provided a focal point for national unity. The government, which had fled to London, was blamed for the defeat. Because of the importance of the Belgian coast as a jumping-off point for a possible invasion of Britain, Hitler decided to leave the military in charge. This led to a somewhat unexpected milder form of occupation than it would have been under a Nazi commissioner. The existing Belgian establishment, the civil service, lawyers, industrialists, the church, and political leaders who were not in exile tried to work with the German military administration to keep the peace and maintain the existing social order as much as possible under harsh conditions. Belgium surrendered quickly before the German onslaught in the spring of 1940. 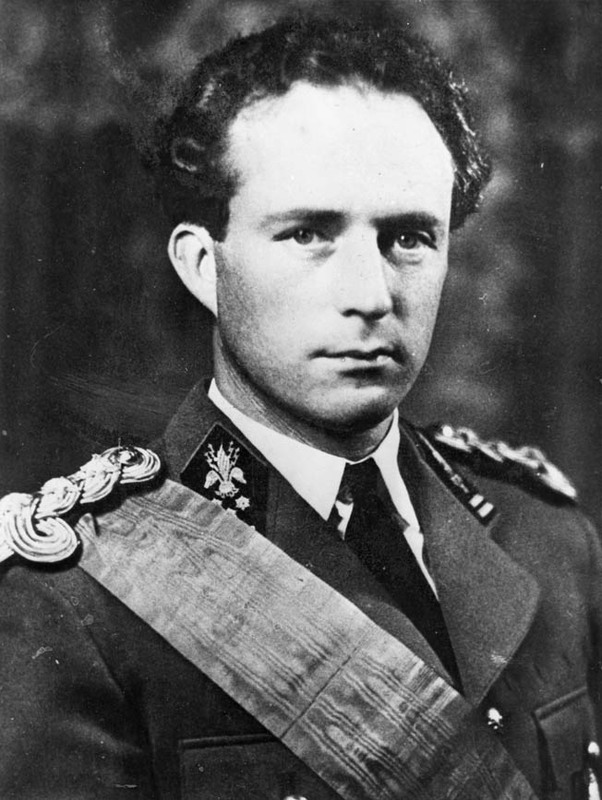 Young King Leopold III was only 39 years old when Nazi troops rolled across the Belgian frontier. Still, the German occupiers showed no mercy to the Jewish population in Belgium. At the beginning of the war, there were between 65,000 and 75,000 Jews living in Belgium with only 6 percent of them being immigrants and refugees. On October 28, 1940, the German military government put forth a decree ordering all Jews to register with the authorities. This led to native Jews being dismissed from the civil service, the legal system, and the media. While this was taking place, most Belgians simply regarded Jews as Belgians. However, when the first train left Belgium for Aushwitz on August 4, 1942, it contained only foreign Jews. By November 1942, some 15,000 Jews had been deported. By this time a Jewish underground organization was in contact with the Belgian resistance. 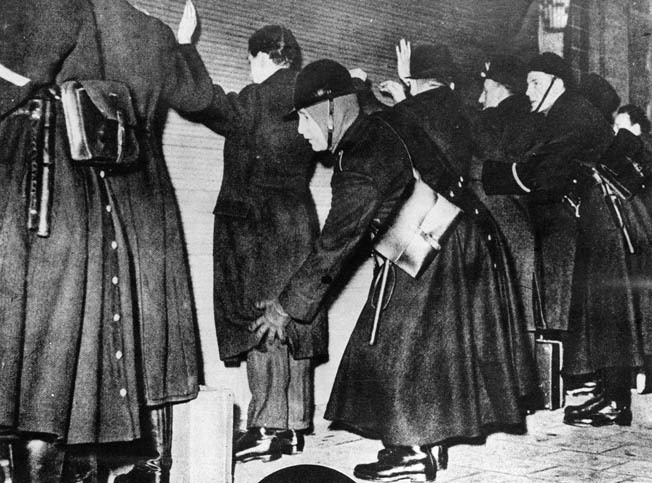 This soon led to a widespread action to bring the country’s remaining Jews into hiding. Local Catholic organizations also played an important role in concealing Jewish children. In addition, the Belgian police were not as willing to assist in the rounding up of Jews as police forces in other occupied countries. These activities contributed to lesser numbers of Jews being sent to the gas chambers, about 25,000 at Aushwitz, while a similar number found their way into hiding. In the end, 40 percent of the Jewish population of Belgium was murdered by the Nazis, a relatively small percentage when compared to 73 percent in the Netherlands. 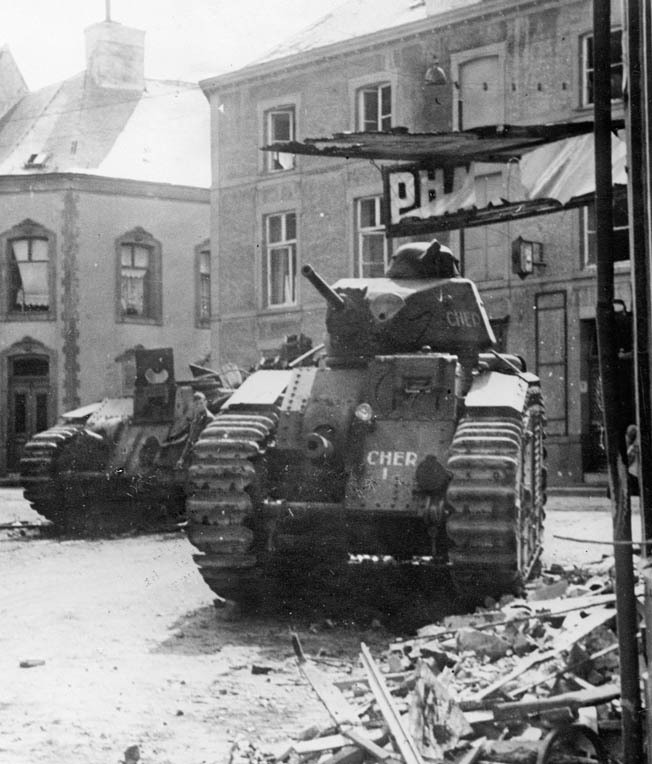 A pair of French tanks knocked out during the fighting to stem the German tide lie abandoned in a town square somewhere in Belgium. There were two main underground groups in Belgium, the Secret Army and the White Brigade. One member of the Secret Army was Madame Renier Janssen, nee Martha Leyder, who participated in an effort called the official escape lines. She lived close to the Dutch border in the village of Eisden. Her group was known as the 59th Brigade of the Gehem Leger (Flemish for Secret Army). 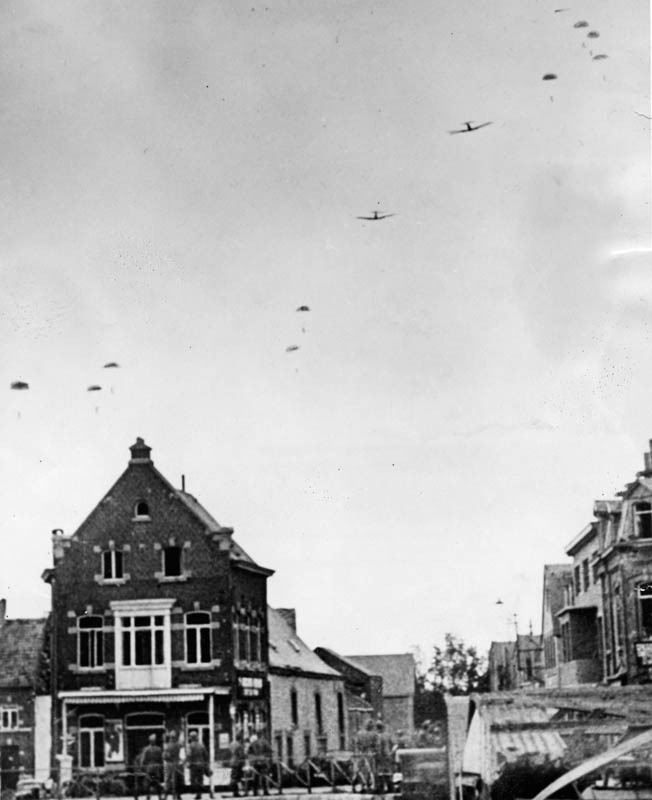 As a result of its work and that of its compatriots all over Belgium, many Allied pilots whose planes had been shot down over Belgian territory avoided capture. The pilots were guided through German-occupied towns and villages to the French border. Other Belgian resistance groups focused on disrupting German operations. 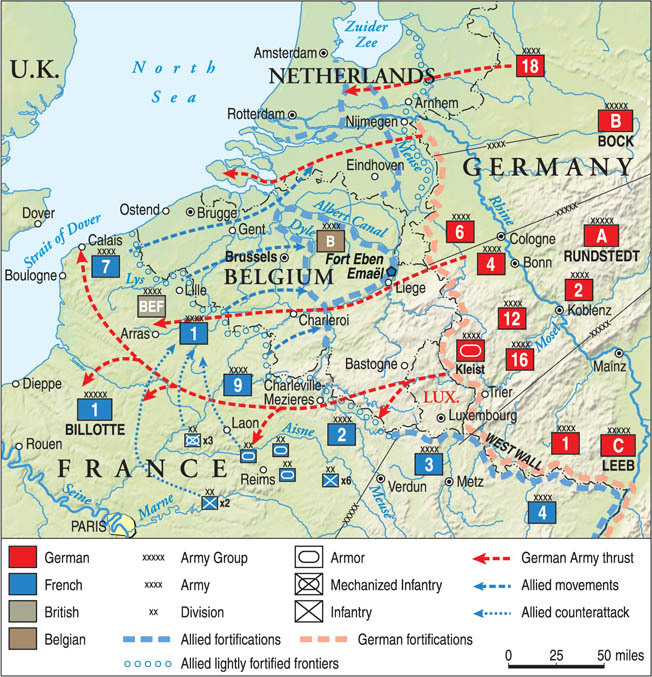 Because of the many major rail lines running through Belgium between Germany and France, the resistance fighters were able to supply the Allies with information on German troop movements. In addition, the resistance played a role in destroying key railways. One of the most successful attacks was on a rail bridge over the Ambleve River, which resulted in a German troop train going into the river with the loss of 600 men. French prisoners carry a wounded comrade into captivity during the fighting in Belgium. As the war continued, the resistance maintained an unceasing campaign of espionage, sabotage, and deadly force. The resistance became increasingly bold in 1943, when German losses in North Africa and Russia encouraged people in the occupied countries to actually believe that Hitler could be defeated. In addition, the intensified efforts by the German occupiers to send more forced labor to Germany to work on farms and in factories caused many Belgians to choose between fight and flight. It was also during this period that the British secret services, joined later by the Americans, increasingly provided both the means and the training that the armed resistance required. The Allied group most concerned with active resistance was the British Special Operations Executive (SOE). The SOE sent 7,000 agents and instructors to the European continent. They included telegraphers, saboteurs, spies, propagandists, and liaison officers. The agents’ most important task was to gather and transmit intelligence back to London. When textile factories in Belgium began manufacturing tropical uniforms in January 1941, the British surmised that the Germans were planning an operation in North Africa. Following the surrender of Belgium, police forces were mobilized to work with the Nazis to round up subversives, Jews, Communists, and other perceived enemies of the new order. These policemen are searching civilians they have detained on a street in the Belgian capital of Brussels. As the war dragged on, the Germans were slowly losing their grip on the occupied countries. Allied forces reached Brussels in September 1944. The important port city of Antwerp was in Allied hands by December 10. However, Hitler was not quite finished. On December 16, 1944, three German armies comprising half a million men attacked U.S. forces in the Ardennes area of Belgium and Luxembourg, achieving complete surprise. The confrontation that ensued became known as the Battle of the Bulge. By the end of January 1945, the German salient deep in American lines had been effectively reduced. 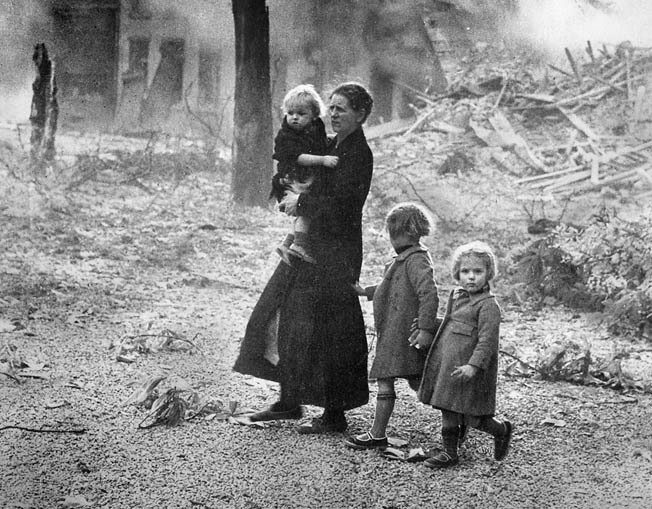 Like other European countries, Belgium was devastated by World War II. Foreign aid, principally in the form of the American Marshall Plan, helped the nation to recover, but the process took years. Tags Adolf Hitler, Alfred Jodl, Allies, alphonse georges, Ardennes forest, ardennes offensive 1940, Battle of the Bulge, Belgium, Blitzkrieg, British Expeditionary Force, English Channel, Fedor von Bock, Gerd von Rundstedt, Hermann Göring, Holocaust, luftwaffe, Luxembourg, Maginot Line, maurice gamelin, Nazi Germany, Rotterdam, Royal Air Force, Secret Army, Sichelschnitt, Special Operations Executive (SOE), wehrmacht, White Brigade, Wilhelm Ritter von Leeb, Winston Churchill.